Emily takes on Spencer in this winter premiere scene. The girls are clearly not getting along well. 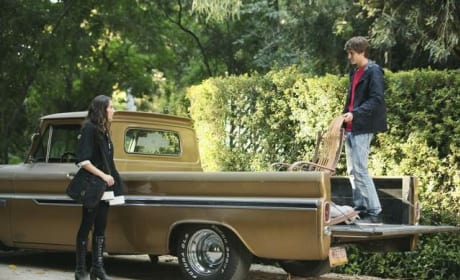 Toby and Spencer interact in this scene from Pretty Little Liars. It's courtesy of the winter 2012 premiere. Chin up, Toby. This Pretty Little Liars character doesn't smile often. How badly have things gotten for the Pretty Little Liars? This photo says it all. What do you think of the Pretty Little Liars in orange? They are on community service here. The girls are back on Pretty Little Liars! But things are not the same between them.